In separate bowls combine wet and dry ingredients. Combine the two mixtures and then fold in carrots, dates, and walnuts. Fill muffins cups 2/3 of the way full. Bake at 400 degrees for 18-20 minutes. Makes 12 muffins. If you have gluten intolerance make sure to buy oat bran and quinoa flour that is gluten free. There are many types of oat bran that while they don't contain actual wheat, they are processed in facilities that also process wheat and are therefore not gluten free. 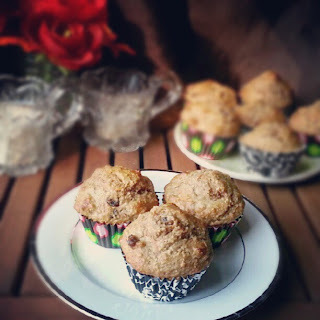 These muffins are really delicious. I have experimented a lot with this recipe and used both brown rice flour and quinoa flour and they have worked well. 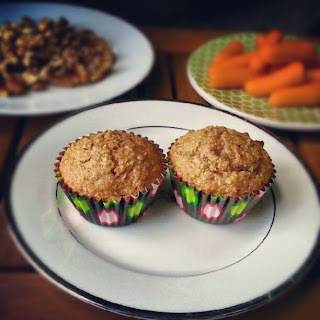 My two boys love these muffins and haven't noticed that they don't have wheat flour. This is definitely a recipe that I will keep making. Recipe adapted from Bob's Red Mill package. gotta try this, thanks for sharing! WOW! These look delicious! I most try it! Thanks for sharing and for stop by my blog. They look lovely! thanks for linking up! I've gone gluten free and these look really good but I still haven't invested in all the gluten free flour alternatives. I have been using some pre-mixed boxed gluten free flour with nice results. I think I will try this recipe with it...should be good. Pinning this one, too!